Attualmente non disponibile e per eventuali bonifici fatti verranno addebitate le relative spese sostenute. 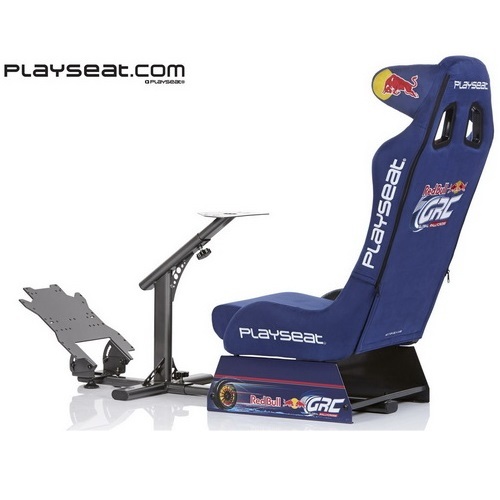 This is the officially licensed Red Bull GRC racing chair from Playseat®! It features the stylish and colorful Red Bull Global Rally Cross logos and imagery combined in one awesome design on the seating and the base of this racing chair. The stitched artwork is of very high quality and consists of unique color matched materials. The seat has a black frame and is coated with high quality blue Alcantara, which is used in real race cars! It can be used by adults and children, so all your friends and family members can enjoy this chair. This race seat is very comfortable, stable and highly adjustable. Thanks to its unique foldable design, it uses little space when not in use. Race like a pro with the Playseat® Evolution Red Bull GRC!